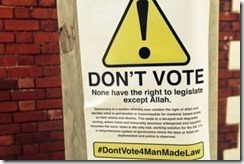 APOLOGETICA » Blog Archive » -Is Islam Compatible with Western Democracy? A few years ago we all witnessed on TV news the sight of thousands of protesters in Tunisia and later in Egypt calling for a change of government. The Western media and the Obama administration called it the ‘Arab Spring’ and celebrated it as a movement in favor of establishing Western style democracies to replace the dictatorships running those countries at the time. However, when the regimes fell the people used their votes to usher in radical Islamic sharia compliant dictatorial governments that were far removed from any kind of democracy. Meanwhile, Muslim political/terrorist groups like al Qaeda, ISIS, the Boko Haram (the name itself means: Western education is forbidden), and the Muslim Brotherhood (which the Obama administration seems to favor), have continued to tell us directly and in many different ways that Islam is not compatible with Western culture and Western style democratic government. So how do the more ‘moderate’ Muslims living in Western countries feel about this issue? Just last week I found a recent poll that showed that 42% of Canadian Muslims believed that their faith was incompatible with the Western society they lived in. I believe in reality a far larger number actually feel that way. Even more proof can be found in the reports all over Europe of ‘no-go zones’ in Muslim immigrant communities where the police are not welcome and roving vigilante groups enforce some kind of neighborhood sharia compliance. It seems to be the younger generation of Muslims that are more radical and observant in their faith and more demanding of sharia provisions than their parents who originally immigrated. 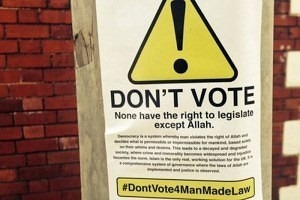 ‘Democracy is a system whereby man violates the right of Allah and decides what is permissible or impermissible for mankind, based solely on their whims and desires. ‘This leads to a decayed and degraded society where crime and immorality becomes widespread and injustice becomes the norm. ‘Islam is the only real, working solution for the UK. Response: The Western media, academic and progressive circles, and most government officials refuse to admit that there may be a real problem for Muslims to whole heartedly accept Western ideals and Western forms of government since they do not recognize and apply the Islamic sharia laws contained in the Quran and Hadiths of Muhammad. Many have adapted and most Muslims are peaceful citizens. Nevertheless, given the choice undoubtedly many would prefer a society and government that recognized Allah and the teachings of the Quran. However, most would also prefer to live in a country that is safe, peaceful, with individual freedoms and a higher standard of living which is why they immigrated to the Western countries in the first place. Ironically, Muslim dominated countries do not offer the same kind of stability and economic opportunity, so very few Muslims would choose to go back. Nevertheless, many hope that the culture and government where they now live in the West will eventually convert and become more ‘Islamic,’ failing to recognize that changes of that kind would probably bring on the same conditions they fled from in the first place. 1 Response to -Is Islam Compatible with Western Democracy?